We welcome you to our story vis-à-vis the fusion of two eras... circa late 1800's for this Dutch Klipper's conceptual barge shape coupled with modern engineering and Biedermeier inspired interior. Built for J&A, a married couple who have chosen a life of permanently living & cruising in mainland Europe. This website will inform about the sailing lifestyle, owners, the construction, the special suppliers (the good & not so!) and outstanding equipment onboard plus the trials of building such a unique project including the disappointed delays. As Winston Churchill once voiced; "Success is not final, failure is not fatal: It is the courage to continue that counts". JENAL's design pushes many technical boundaries and in consequence, pushed some artisans beyond their abilities. Learn more from this helpful website. 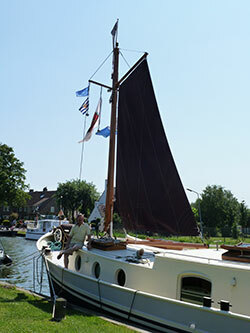 JENAL is the name of this Dutch Klipper (derived from JENnie ALan an example of historic Dutch vessel naming tradition). 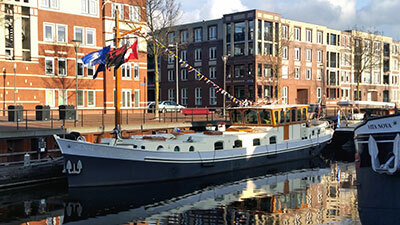 She is a type of Dutch barge but as her owners would say "one with improved style and classical beauty". She measures 23m x 4.75m (75' x 15' 7") and externally replicates a late 1800's Dutch Klipper. Klipper's of this era were originally powered by sail but this modern interpretation is powered by 2 x Volvo-Penta diesels. She uses both a stay-sail and her on-board spud-poles to steady her when JENAL negotiates deeper windblown costal waters and seaways. This is a unique story because a replica of a Dutch Klipper had not been successfully recreated and certainly not to this exceptional standard. 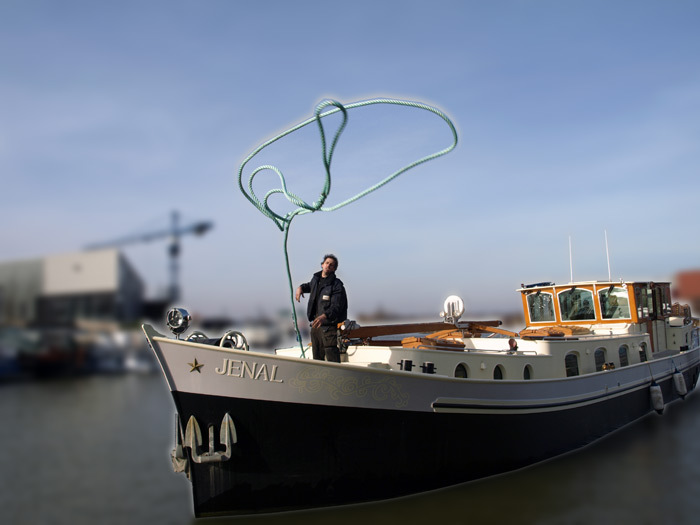 Highlights of why JENAL is so special: #classic circa 1800's appearance, #modern hydrodynamic hull engineering, #auto lowering wheelhouse, #Biedermeier inspired cabinetry, #luxury interior fittings, #sun deck, #multipurpose mast, #pin-anchors (also act as keel), #twin transverse engines, #counter rotating props, #hydraulic drive & generator and #bow hold for road and water transport. Compromise is part of our everyday lives but most apparent in barge-life. Alan, JENAL's owner & prime designer has reduced these restrictive compromises of living aboard a barge by creating for wife Jennie and himself , a 1200 sq-ft sumptuous home with the assistance of some of the finest equipment, manufacturers & suppliers available today. Enabling J&A to comfortably live and explore expanding Europe with its beckoning 100,000 miles of inland waterways. 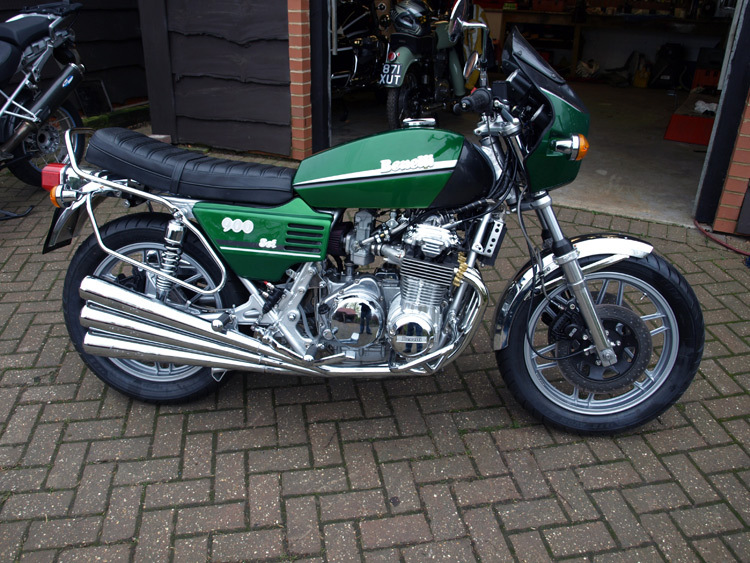 Plus room for their 'lifestyle essentials'; Classic Benelli 900 Sei motorcycle, fast RIB, fold-up bikes, golf kit, etc.